Growth form: Perennial grass. Flowering. Apr. Status: Native. Very common. Also recorded: Bahrain, E Saudi Arabia, UAE. Habitat & distribution: Abundant on sand sheets, sandy depressions and other sandy habitats. 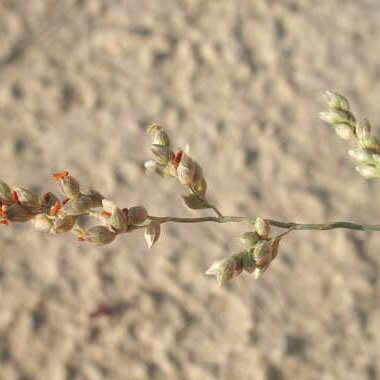 Especially common in S and SW Qatar, where it is a major component of the natural perennial vegetation. It probably avoids saline sand. Uses: Described as good fodder by El Amin. Mandaville said it was reported that bedouin used this as food during famine. Jongbloed et al. note that it was used as a wound dressing. The species is a natural sand binder and could have potential for stabilising sand dunes.